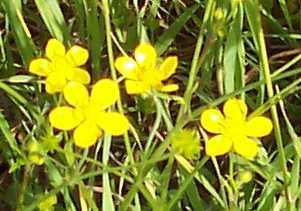 The Ranunculus at the Santa Rosa Plateau Ecological Reserve (henceforth SRP here) was a source of puzzlement to me from 2001 until 2006. Every year when the plants bloomed, I'd study them some more to try to understand why Lathrop and Thorne (1985) determined the species as R. californicus, despite most flowers having the 5-6 petals of R. occidentalis, and not the 7-22 petals of R. californicus. All the references supported the Lathrop and Thorne (1985) determination. Munz gives only R. californicus as being in southern California south of the Tehachapis, and the Jepson Manual says that R. occidentalis is not present in the SW. These floras largely followed the last monograph on Ranunculus published by the noted expert on southern California plants, Lyman Benson, in 1948. Benson presents a beautiful map which cleanly separates 21 Ranunculus taxa, showing the distribution for these two taxa as above. So surely there was some more-cryptic feature of these plants that revealed them to be R. californicus and not the R. occidentalis they appeared to be. As a beginning botanist in 2001, I was not about to question any determination made by a professional botanist. 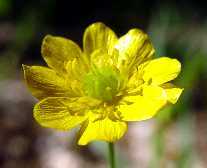 Nonetheless, it was still unsatisfying that the number of petals disagreed so violently with the number of petals that R. californicus was supposed to have, so in mid-March 2003 I reexamined the determination. That year, I finally consulted Munz and discovered that the variety of R. occidentalis found in the southern Sierra Nevada and the Tehachapis was var. eisenii, with beaks 0.5-1.0 mm long. This was almost precisely the length of the beaks of the SRP plants! Apparently, the more numerous other varieties had longer beaks, accounting for the gen 1.5-2.5 mm in the Jepson Manual description for R. occidentalis. So I was back to being puzzled again, enough so that in late March 2003 I made my first visit ever to a herbarium, the famous Rancho Santa Ana Herbarium, to see the Lathrop and Thorne vouchers from the SRP. I was greatly surprised to see those vouchers; one voucher was of a plant with 8 petals per flower on most flowers! I've seen perhaps 1 in 1,000 plants like that at the SRP, and it is understandable that they keyed that one to R. californicus. 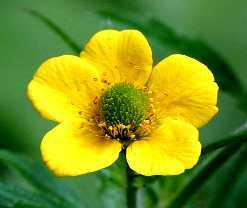 A second voucher showed a plant with 5 petals per flower, our typical plant at the SRP. 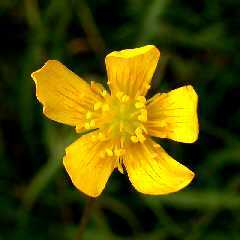 Thorne called that "R. californicus, app. R. occidentalis" (I assumed that app. meant appearing as). 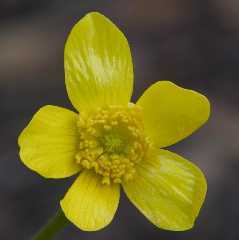 Their third and last voucher showed a plant with 5 petals, with simply R. californicus as the id. It began to seem likely to me that the Lathrop and Thorne determination was based on this non-representative sampling of the plants at the SRP, combined with the common knowledge at that point that "R. occidentalis doesn't occur in southern California except in the Tehachapi Mountains". Lathrop and Thorne cannot be faulted for either the non-representative sample nor the determination. Most likely, Lathrop and Thorne simply intentionally sampled the extremes of the population, to see if they were possibly different species. This is a good thing to do when compiling a flora, but potentially misleading to anyone who studies voucher specimens in deducing the properties of the population as a whole. Also, botanists don't often spend much time worrying about specimens being a taxon not known to be present in an area, for the following excellent reason. There are plenty of species whose determinations are difficult, so it is general a waste of time to always make sure a given specimen is not a species found only outside of the area one is studying. In April 2003 I finally saw my first true R. californicus at Laurel Canyon in Orange County. I was ecstatic!! 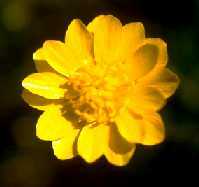 The flowers had an average of 10 petals each, exactly in the range of what the floras said they were supposed to have! Even more interesting, the plants were growing in a completely different habitat than the plants at the SRP. Their habitat was a shady moist hillside bank near a moist drainage, whereas the SRP plants are often found completely out in the open as well as in dryish drainages. There was no doubt that these specimens looked at a glance like a completely different species than the SRP plants. This observation stimulated me to begin to collect data on Ranunculus plants I ran across in the field in order to help understand this situation further. There are plenty of species with incredible variation within the species, so an observation that these plants look different is not sufficient to prove that they are a different species. 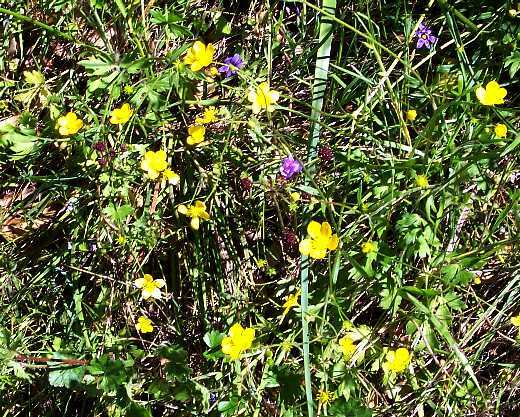 In July 2003, I ran across a population of R. californicus at Palomar Mountain, and compiled a histogram of the number of petals for these plants (see below). Once again, these plants fit the description of R. californicus, and looked very different from the SRP plants. I later realized that the petal shape was also an important discriminant. 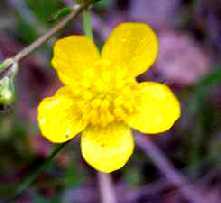 In 2004, I collected and measured petals from the SRP plants, and R. californicus in three locations: Laurel Canyon (Orange County), Hondo Canyon (Santa Monica Mountains), and Garnet Peak (Laguna Mountains). 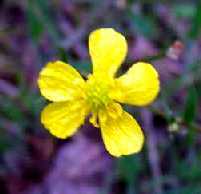 Analysis of the petal shape also confirmed the plants at the SRP were only consistent with a determination of R. occidentalis. 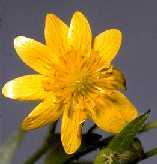 On 10 and 16 March 2005, I took pictures of 38 groups of flowers from six widely-separated locations, all with GPS locations, to produce and document an unbiased histogram of the number of petals for the SRP plants. In most locations, essentially every flower was photographed. 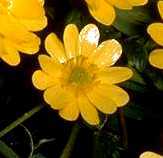 Each picture contains ~20 flowers that can be measured; the data from a random subset of these pictures is given below. Finally, in 2006, I had the good fortune to be shown a population of R. occidentalis in the southern Sierra Nevada, in a location where no one has ever claimed that any plants there are R. californicus. These plants looked like clones of the SRP plants! The moment I saw them, it removed any lingering doubts I had about the classification of the SRP plants. The SRP plants unambiguously key to R. occidentalis, are identical to plants of that species growing in the Sierra Nevada, and are distinctly different from true specimens of R. californicus in southern California. 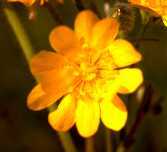 In particular, the flowers have 5 petals the vast majority of the time, sometimes 6 petals, and very infrequently up to 12 petals, and the petals are ~roundish. 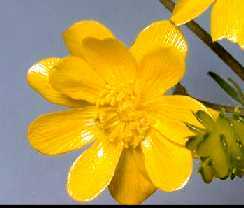 These are both key characteristics of R. occidentalis, compared to the 9-17 petals and petal length ~2-3 times its width of R. californicus. 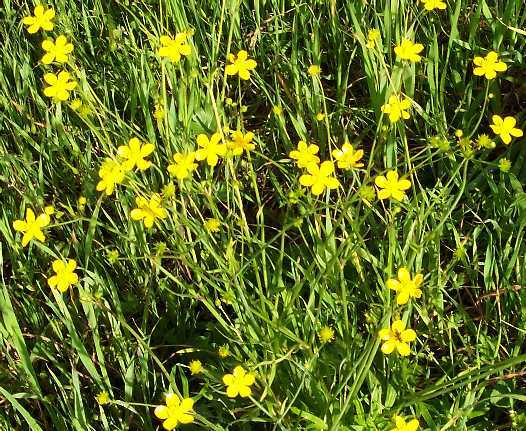 The SRP plants also have only the glabrous receptacles of R. occidentalis. 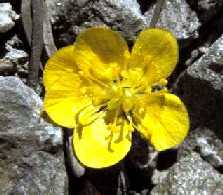 R. occidentalis: petals 5-14, yellow, 5-13 x 1.5-8 mm. 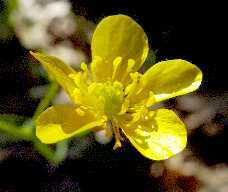 although Jepson's Flora of California says R. californicus uncommonly as few as 7 or 8. The most dependable character for the segregation of these forms [the species] seems to lie in the number of corolla parts. The petals of R. californicus vary most commonly from 7 to 16 and we determined the modal value to be 12 which if graphically represented makes a 2-sided figure. 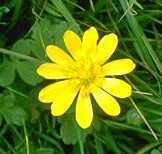 The petals of R. occidentalis are 5, varying to 7 or 8, the modal value being 5 and representing a 1-sided figure. This seems to be therefore the soundest test of differentiation between these two species. The following pictures show some randomly-chosen specimens at the SRP for the reader to see for themselves how clearly these plants key to R. occidentalis. The photographs were taken on 10 and 16 March 2005 as described above. The number of petals is overwhelmingly 5. 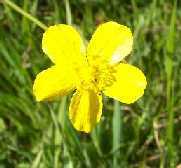 The petals are without doubt just 1-2 times as long as broad, and not 2-3 times. 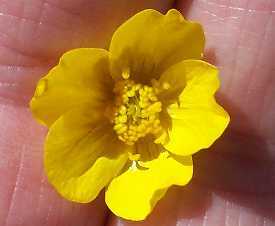 The keying is unambiguous: petals 5-6 and petals roundish goes to R. occidentalis in every flora. In addition, although there weren't enough blooms to histogram, the number of petals in the Laurel Canyon R. californicus was 10 on 4/13/03, and 13-14 on 5/9/04, consistent with the distribution for the Palomar plants. As mentioned above, I have observed a larger number of petals on some flowers at the SRP, but they occurred too rarely to show up in the above histogram derived from my random pictures. The two lines in the above plot give the range of length and width given in Munz and in the Jepson Manual. The slopes of the lines correspond to the following ratios of length to width: for R. californicus, 2.2-3; for R. occidentalis, 1.5-2. The above two plots clearly demonstrate that the only possible determination for the SRP plants is R. occidentalis, and that they are distinctly different from the other southern California specimens studied of R. californicus. 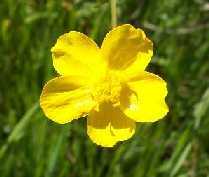 The SRP plants do not grade into any of the other studied populations of R. californicus; a hypothesis that the SRP plants fall within the variation seen in the other specimens is clearly rejected. The SRP is ~120 miles distant from the Tehachapi Mountains, and ~150 miles distant from the bulk of the R. occidentalis population in the southern Sierra Nevada. Similar disjunct populations happen occasionally in many species, and are usually of much interest to botanists, since they give clues as to the former distributions of such species. The SRP contains other taxa that are not "supposed to be" in Southern California, such as Plagiobothrys fulvus. The landscape of the SRP has been essentially intact for the last 8 million years, and thus hasn't been subject to the massive erosion or deposition everyplace else has experienced. The SRP has basalt, an unusual soil type like serpentine. It is very plausible that R. occidentalis once was more widespread in southern California during the cooler climate when the Ice-Age glaciers were at their greatest extents. These plants on the basalt at the SRP are likely a remnant population from them that adapted to the basalt, and thus did not participate in the evolution to or replacement with R. californicus. A disjunct distance of ~120 miles is less than one-fifth the 600+ miles for the limestone disjuncts in the Sierra Nevada. Your task, if you believe that any of these are R. californicus, especially the ones from Riverside County, is to pick out which ones are R. californicus.